Apropos of yesterday’s post about using Google to convert joules to electron volts, a friend of mine emailed this morning to say that Wolfram Alpha would be an even better choice. It’s one of his favorite time wasters, he said. the price of a gallon of milk?1 So I did. Answer: $20 million gal, whatever that means, which converts to $4.62 billion cubic inches, whatever that means. If you ask for the price of a quart of milk, it tells you the milk production budget for the Quart region of Italy. Thanks, Wolfram Alpha! But does Google do any better? Sort of. I typed in the same question, and one hit was from an elementary school class project telling me that a gallon of milk costs $2.99 in Bakersfield, along with conversions of that amount into pounds, lira, and punts. Which suggests this data might be a wee bit out of date. Another hit was from Yahoo Answers, which informed me that the price of milk was “OUTRAGEOUSLY TOO HIGH,” and then provided a range of prices from around the country. The “Best Answer,” garnering two votes, was $3.50. That was in 2008. Ask.com provided answers for 1917, 1950, and 2007. In a way, this is the internet in a nutshell. One site provides a very precise answer that’s spectacularly wrong. Another site provides a fantastic wealth of answers, all of which are sort of wrong in various different ways. But if you’re smart enough to reformulate your search as “usda milk price retail,” as I eventually did, you’ll get this extremely authoritative-looking document from the USDA that provides average retail whole milk prices in 30 different U.S. cities for January 2012. The average is $3.69 per gallon. Other reports are available for reduced fat milk, organic whole milk, and organic reduced fat milk. Moral of the story: the internet makes dumb people dumber and smart people smarter. If you don’t know how to use it, or don’t have the background to ask the right questions, you’ll end up with a head full of nonsense. But if you do know how to use it, it’s an endless wealth of information. Just as globalization and de-unionization have been major drivers of the growth of income inequality over the past few decades, the internet is now a major driver of the growth of cognitive inequality. Caveat emptor. 1Yes, I know that’s not really what Wolfram Alpha is for. No need to ruin an entertaining post over it, though. 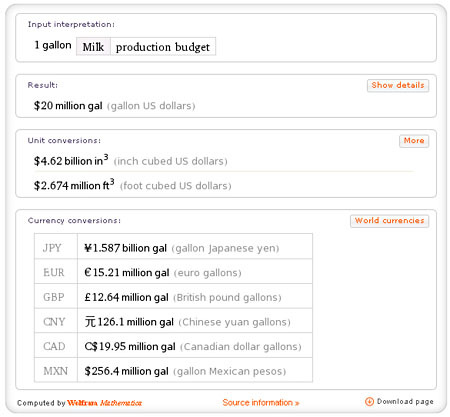 UPDATE: Via comments, it turns out that if you type “How much does a gallon of milk cost?” into Wolfram Alpha you get the nonsense above. But if you type “price of milk” instead, you get a nice chart showing the price of milk. Live and learn.